The Feiss Opera large Art Deco style torchiere floor lamp in Firenze gold with champagne glass is classic, stunning and is typical of the type found in New York during the 1930’s. Featuring an intricate rounded cross base and highly decorative torchiere stem, with large fluted speckled champagne scavo glass uplighter dish. 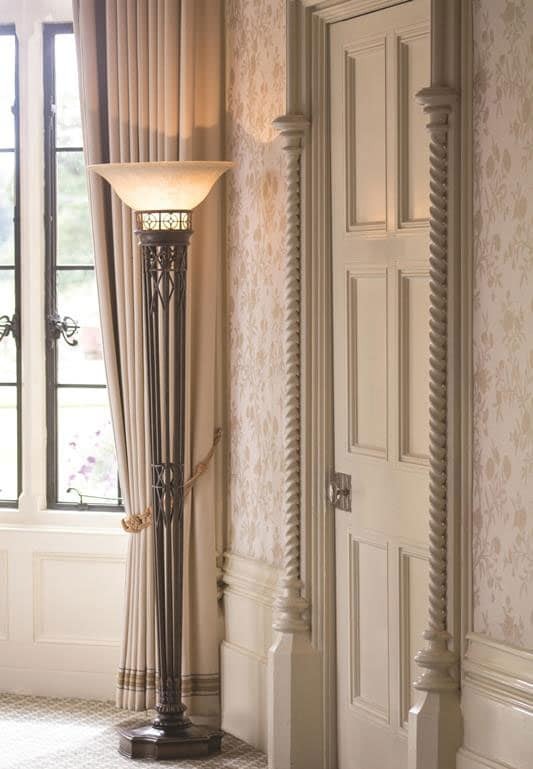 This is a large floor lamp that features geometric patterns and intricate detail that is perfect for making a grand statement in a large entrance hall, Art Deco themed dining room or living room. This elegant light is supplied by Elstead Lighting and designed in the USA by Feiss, founded in New York in 1955. They have become well known over the years for their contemporary yet classic styling, quality and great original designs like the Opera large Art Deco style torchiere floor lamp in Firenze gold with champagne glass you see here.